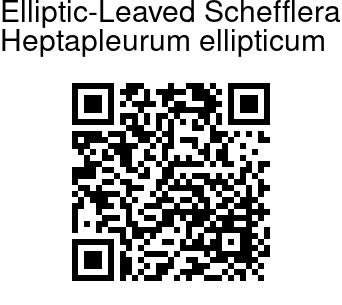 Elliptic-Leaved Schefflera is shrubs or small tree, up to 10 m tall, sometimes climbing or growing on other trees. Leaf-stalk is 4-14 cm long, carrying digitately compound leaves. Leaflets are elliptic to oblong or obovate, 11-16 × 4-6 cm, leathery, both surfaces hairless, tip pointed to long-pointed. Stalks of the leaflets are 2-5 cm long. Flowers are borne in panicle of umbels at the end of branches. Inflorescence issparsely to densely hairy when young, later hairless. Primary axis is 4-30 cm, secondary axes up to 18 cm. Flower-stalks are 2-3 mm long. Calyx is obscure. Ovary 5-carpellate; stigmas 5. Fruit is ovoid to ellipsoid or round, 3-4 mm, 5-ribbed when dry; disk broadly conic to pyramidal. 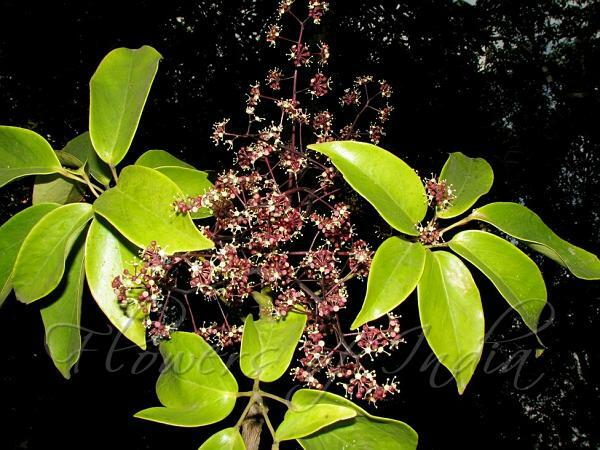 Elliptic-Leaved Schefflera is native to China, SE Asia, NE India and Australia, cultivated for ornamental purposes. Flowering: March-July.